Quality Black-Box Entertainment System with FUSION-Link! In marine stereos Fusion is recognized as one of the best, so if you have a small area but want big sound and connectivity their BB 3300 Black Box with NRX300i wired remote is one not to be overlooked. The BB3300 is a compact entertainment solution that blends performance into a discreet package that can easily be concealed in small spaces at your helm. The BB 3300 has multi-zone capability with up to 3 zones being supported at one time. Zones 1 and 2 without the aid of an additional amplifier. Zone 3 requires the aid of an additional amplifier. Once the BB3300 is installed and connected to your NMEA 2000 network, Fusion-Link enables it can be controlled through a certified MFD on the network or the NRX300i wired remote that comes with it. Also because the BB3300 is Fusion-Link enabled it has capability to be controlled via Ethernet or WiFi networks as well. Streaming your music from any compatible Apple, Android, or Windows player can be controlled either through the paired MFD or remote. The Black box itself has an aluminum heat sink molded to the chassis side panel which allows it to more effectively disperse heat allowing you to sustain high performance. Not to be overlooked is Fusion’s 3 year warranty which is the longest in the industry, giving you further piece of mind. If you don’t have much room at your helm but still want to add a premium sound system that gives you multiple places of control and multiple zones for sound you should definitely consider the Fusion BB3300 Black Box with NRX300i wired remote control. 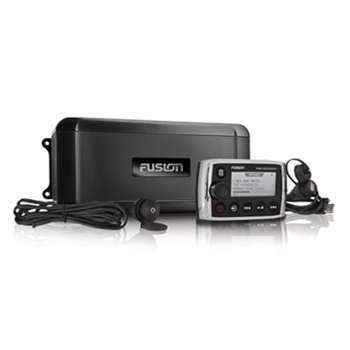 Each Fusion Black Box comes with: Fusion MS-BB3300 Black Box, MS-NRX300i Wired Remote, Powered Drop Cable, 6M NMEA 2000 Backbone Cable, NMEA Inline & Female Terminator, NMEA 2000 T- Connector, Power & Speaker Harnes, 1M Panel Mount USB Socket, 3.5mm Panel Mount Audio Socket, Mounting Kits, Users Manual and a Three-Year Limited Warranty.